What is the first thing that strikes our mind when we talk about FMS? Is it the fees of FMS or ROI for FMS? Definitely it is ROI. Whenever we compare b-schools in our country, FMS stands out as a college with the best Return On Investment (ROI) just because fees for 2 year MBA program is less than 25,000 INR and average package is same as of top IIMs. There are lot of online career solution portals which provide all sort of information including b-school rankings like InsideIIM, Careeranna, MBAuniverse and the list goes on and if you search FMS on the same, you can find mentioning of ROI or fees in every second article. Now I am not against this perception that is out there regarding FMS but I want to say it loudly that there is much more than ROI which you guys would love about this b-school. Recently, one online MBA portal gave a dismal ranking to FMS which actually was quite shocking for us considering the fact that our placements were better than last year and at par with other b-schools. On seeking reasons, we were informed that one of the major factors that went against FMS is its lack of infrastructure. Now for those who haven’t been to FMS, FMS is a single red building with not much infrastructure and other sports facilities. Well I don’t and have never seen it as a negative for FMS. Lacking the infrastructure does have disadvantages, but then if we look at the bright side, FMS has been producing country’s most efficient managers since 1954 with this single building which is well known as Red Building of Dreams. So, if you come to FMS, then at first might get bogged down by the size of this faculty but as a famous saying ‘ big things come in small packages ‘, you will fall in love with this building with time. 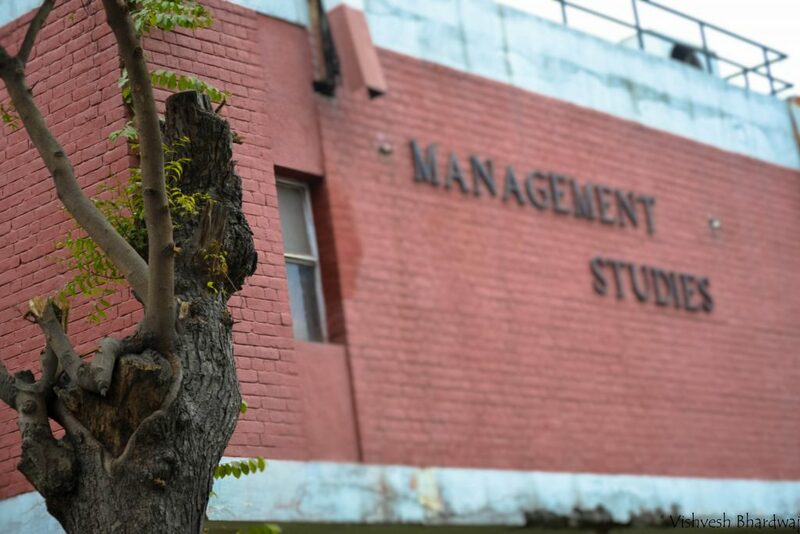 Second, there is a wrong perception among the students from other colleges that FMS is a chill campus and academic rigor is quite low as compared to IIMs. We definitely agree with the second argument regarding academic rigor since FMS has a semester system, unlike trimester system in IIMs since FMS is part of Delhi University, but it is definitely not a chill campus. FMS has been trying really hard to change this perception and taking steps in this direction, 90% attendance policy was implemented from last session. So, if one needs to sit in placements, 90% attendance is mandatory. Quite a chilling experience we are having here trying to maintain our attendance!! Third, FMS is not just a frontline b-school in terms of placements but also known for winning corporate competitions and events. The list of competitions that FMS has won is quite long and it includes coveted events like Amazon Ace Challenge, Nestle 4P challenge, Coca-Cola showcase, Mahindra Warroom, HUL Lime, PepsiCo Being Indra’s Adviser, Henkel Innovation challenge and many more. FMS has a culture of participating in every major corporate competitions and FMSites have proved their mettle in most of these events. One of the major reason for the same can be attributed to the support and expertise of faculty members and support from our alumni. Faculty members here are very supportive and are always ready to help you with any kind of MBA conundrums. Fourth, FMS is the only b-school which conducts Management fest (Fiesta) and Cultural & Sports fest (Elysium) separately. While most of you might be wondering that how does FMS conduct sports fest since it does not have its own grounds and sports facilities, but you guys are forgetting a major fact here that FMS is a part of DU and hence, we have access to the sports facilities of other well-renowned colleges of DU like Hindu, DSE, SRCC etc. Just one permission and we are on!! There are lot more to talk about other than just ROI for FMS, but in the end, I think it would be wise enough to say that although FMS charges a mere 10,000 per year, but it has never compromised in terms of quality of education which is justified by the positive industry perception and the kind of performance FMSites are delivering at their respective workplaces. I hope this article might be able to change your perception about this Red building little bit if not much. An avid photographer and cricketer by heart. Love singing and playing video games. Trying reading novels. P.S. -Picture posted above is clicked by me.